I’ve now tried the product, and I’m pretty much underwhelmed. I’m sure you see why when you look at the swatches above. The eyeshadows felt soft and silky, but they weren’t very pigmented. They came out really pale and lacklustre. 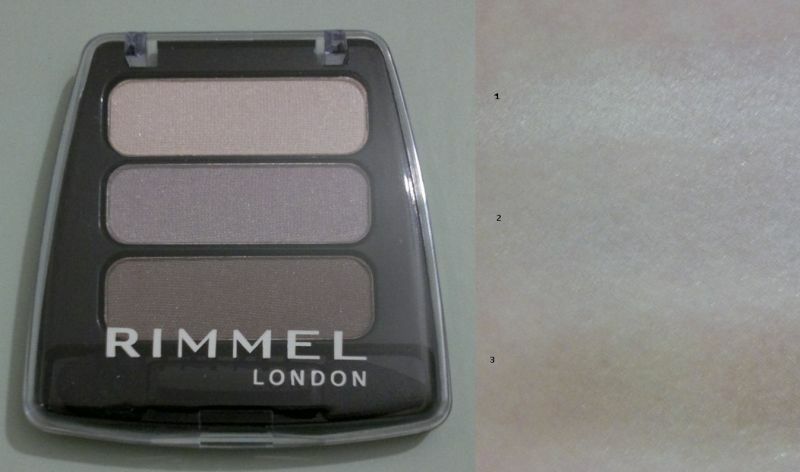 I think this would explain why this pretty-looking neutral eyeshadow trio ended up in a discount store. I will definitely use these three eyeshadows, but since they’re so pale, I can only use them as highlighter (shade 1) or blending shades (shades 2 and 3). Anyway, I hope my other recent beauty bargains will not let me down. I never really knew what to do with Pueen’s 63 plate from their Stamping Buffet collection. 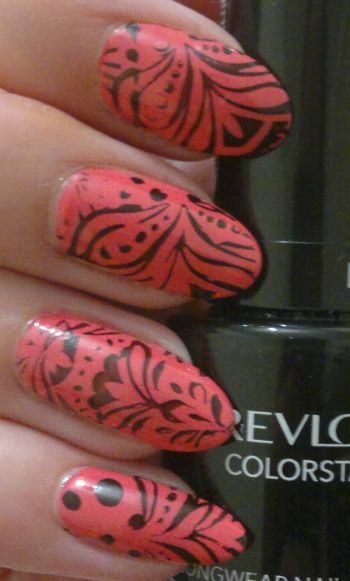 I thought I’d just paint all my nails in a different colour and give this stamping plate a try. I used: Boots 17 Pretty In Peach (pinky), Rimmel Salon Pro 500 Peppermint (ring), Astor Fashion Studio 137 (middle), NYC In A Minute 264 Lincoln Square Lavender (index). If you wonder about the thumbs – I used Orly Snow Cone (light blue). Too bad I didn’t capture that one! And the black ‘stamping polish’ is Revlon Colorstay Stiletto. Hi there! Since I’ve done two nail posts since Monday, I decided this week would be nail week. 🙂 And I hope you’re enjoying nail week as much as I do! So for this mani I dug out one of the more interesting glitter toppers I have. But let’s start from the beginning. 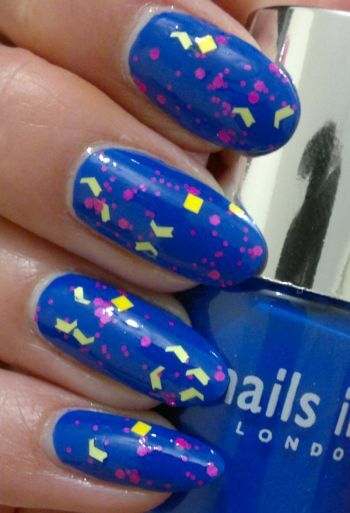 At first I painted my nails with Nails Inc.’s Baker Street (2 coats), a beautiful medium blue that really pops. Then I painted on one coat of glitter topper. This one’s called All Sorts and it’s from Claire’s Accessories. This glitter topper features lime green, yellow and pink glitter in different shapes and sizes. Btw, I love the yellow squares the most! 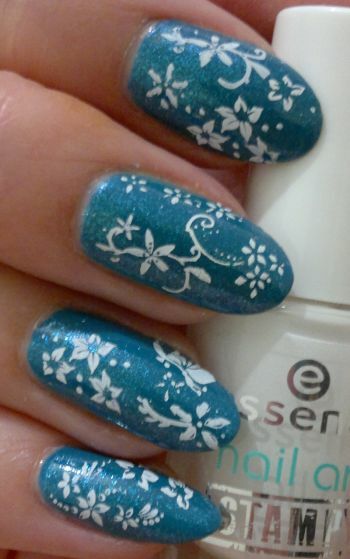 So instead of painting my nails white and stamping on blue flowers, this time I did it the other way around. I painted my nails with NYC In A Minute 296 Water Street Blue (2 coats), a medium blue with a creamy finish. Then I added 1 coat of Sally Hansen’s HD 03 Pixel Pretty, a shimmery turquoise which adds a lot of sparkle! And then I stamped on a few different floral images from different stamping plates – using the fabulous white Essence Nail Art Stampy Polish. How do you like this mani? 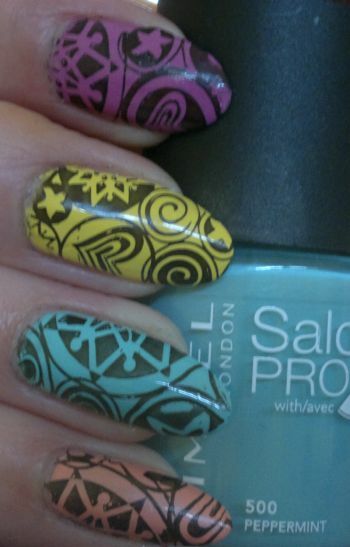 And which one do you like better – the original blue on white mani or this one? Feel free to comment and thanks for stopping by! Hi there! I’ve wanted to review Poundland’s own brand make-up brushes for quite some time – because I’ve been using them for ages and I’m very happy with them. Allura is Poundland’s old own brand. They do all kinds of different brushes – kabuki, foundation, blush, powder and eyeshadow brushes. And I’ve got them all. I’ve only taken pictures of the double-ended angled eyeshadow brush, the kabuki brush and the angled blush brush – that’s because these were the only unused back-up brushes I could find right now. I also want to apologise for the poor photo quality. Due to the lighting it was impossible to take better pics of the brushes in their original packaging. But back to the brushes! What I like about Poundland’s make-up brushes is that they’re synthetic. If you’ve got trouble with brushes with natural (= animal hair) bristles, you’ll be fine when you use these brushes because the bristles are 100% synthetic. I also love the quality of Allura’s make-up brushes. I’ve been using some of their brushes for well over a year – and they still look pretty good. I clean my eyeshadow brushes after each use, so I’m not easy on them! I’m very happy with my Poundland make-up brushes and I can only recommend them. I also think these would be great for someone who’s just starting to get into make-up, but who likes to experiment. A collection of all of Poundland’s make-up brushes would make a great gift for a young lady! 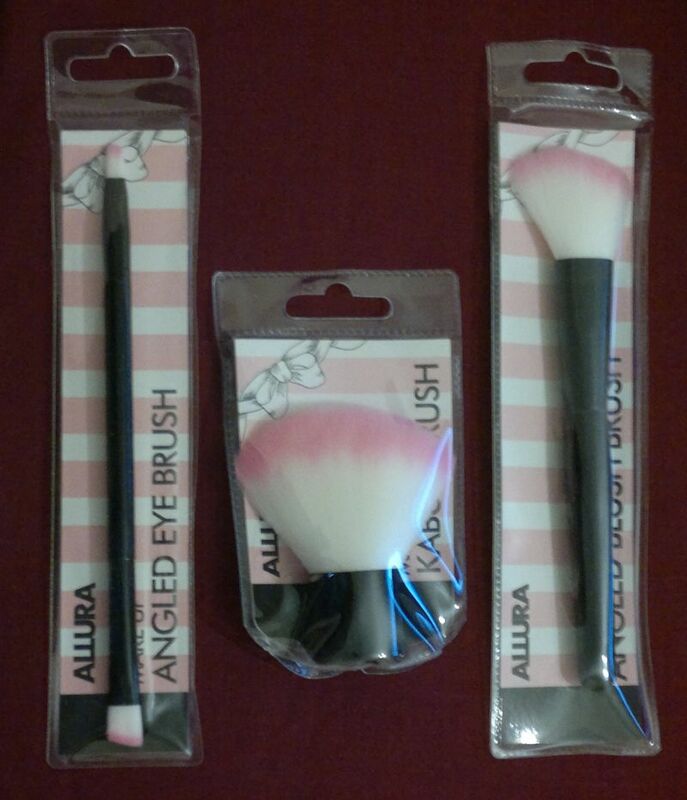 Poundand’s Allura make-up brushes are £1 each. But Poundland is currently giving some of its own brand stuff a make-over. And these pretty brushes are being replaced with simple black & white ones under their Make-Up Gallery brand. If you’d rather have these girly ones, you need to be quick! And if you’re a nail nut, check out Poundland’s nail art brushes, too! Hi there! On Boxing Day I picked up quite a few half price gift sets. And now I’ve finally tried Boots’ Christmas-themed offerings. So today we’re looking at Boots Extracts Festive Spiced Apple Body Wash, Body Scrub and Body Butter. Boots Extracts Festive Spiced Apple Body Wash lathers up nicely. The body wash isn’t too drying and the apple scent is intense and really festive. Nice one! Boots Extracts Festive Spiced Apple Body Scrub is not that great. Whilst the scent is lovely, the scrub doesn’t contain many scrubby bits. It does make my skin feel much softer, but this scrub is too gentle for my taste. 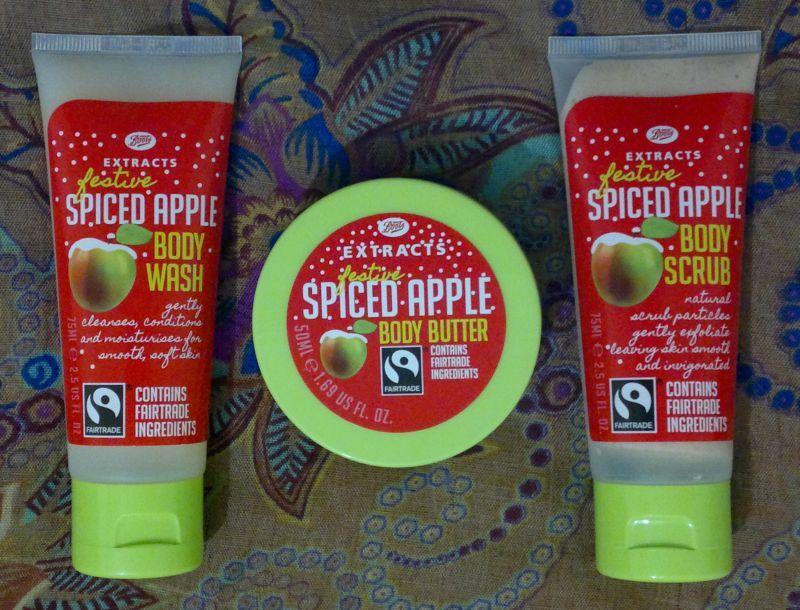 Boots Extracts Festive Spiced Apple Body Butter is just as fantastic as all the other Extracts body butters I’ve tried. It’s not too thick and not too thin, and I found it super easy to massage it into my skin. This body butter is very moisturising, but it’s not sticky at all. And it smells wonderfully natural of apples with a touch of cinnamon. 10 stars! These three products were part of a large “For All Seasons” themed set containing products from four different Boots Extracts products lines. The total for these three travel size products (75ml Body Wash and Scrub, 50ml Body Butter) works out as £2.50.